So here we are, at the end of the year. I'll get more into the year end stuff tomorrow, but for now, I don't know how the hell it is December and there are only two days left of this year. This month has had an extreme high and an extreme low, and everything has been going kinda slow (I did not mean for that to rhyme), but I didn't get a whole lotta movies watched like I wanted to - I still have a little over 24 hours to get watching, including my only watch of Inception this year tomorrow before midnight. However, I'm working with what I've got now, and I'll also share some stats of my movie watching in 2012. Love Me Tonight - A 1932 musical I'd always wanted to see, and eventually found while strolling through YouTube. Man, I love YouTube. They always have the greatest discoveries. Love Crime - It was on TV so I decided to give it a go, mainly because I am somewhat interested in the remake, Passion. This one was okay, but it was extremely frustrating. Bernie - I literally sat through this entire film going "my lord, this is such a bizarre, but really good story". And then at the end I found out it was true. Probably one of the bigger "WTF" moments I've had this year. Weekend - I adored this film. It was so well scripted and acted. One day I'd love to make something like this. Abraham Lincoln: Vampire Hunter - So, this happened. It took itself way too seriously. The Grey - I have a poster of this to put up in my room (because I always get Liam Neeson posters since he's my Dad and all...but I probably won't be getting one of Taken 2), but I don't want to take down any of my other posters. Ah, the times and trials of my life. Cheerful Weather for the Wedding - I saw it just because Felicity Jones was in it. She was lovely, but the film wasn't particularly memorable. Your Sister's Sister - I just love this movie. Iron Sky - This also happened. How, I'll never know. Take This Waltz - This film keeps popping up on 'Worst of' lists, which I think is a bit far, but a little unjust. It wasn't very good, yet it wasn't terrible. I did really like Seth Rogen in it, though. The Campaign - A lot funnier than I thought it would be. Starter for 10 - This movie seemed to have literally everyone in it: James McAvoy, Alice Eve, Rebecca Hall, Benedict Cumberbatch...oh, those Brits know how to make anything better. Step Up 4: Miami Heat - The dance scenes were really good, but as always, the story and the acting wasn't at all feasible. Bellflower - I wasn't all that taken by the story, but the cinematography in this was really cool. Plus, it was made for around $10,000, which is insane. The Bourne Legacy - Man, I love Jeremy Renner. I didn't quite love this movie, but I did love Jeremy Renner. Hope Springs - Maybe it was just because I watched this the night after Grandma passed so I wasn't in the best headspace, but this movie was actually terrible. Seeking a Friend for the End of the World - However, I did see this one straight after (ironically on the night before the world was supposed to end) and I really liked it. So maybe Hope Springs was just terrible. The Assassination of Jesse James by the Coward Robert Ford - It was a shade too long, but it was so beautifully shot. Roger Deakins in the best. High Fidelity - I will definitely check this out again, as I wasn't all that focused on it. I did like what I could understand, though. The Expendables 2 - I'm actually sure that this is the US version of The Best Exotic Marigold Hotel. Moonrise Kingdom - This movie made me very uneasy. Still, I quite enjoyed it, considering I'm not the hugest fan of Wes Anderson. The Adventures of Priscilla, Queen of the Desert - Decided that I may as well watch it, just to see a young Guy Pearce at work. He did not disappoint. Love Actually - Because Christmas happened and this was the only way of reminding me of that fact. 21 Jump Street - Because I needed some LOLs and this movie has approximately 134 of them. The Dark Knight Rises - Because it was Christmas Eve and that's always a good time to watch this movie, along with the other 364 days of the year. Meet Me in St. Louis - Because it was Christmas and I watch this every Christmas. Lost in Translation - Because I'm going to Japan in 9 days. Which is not something I get to say every day. 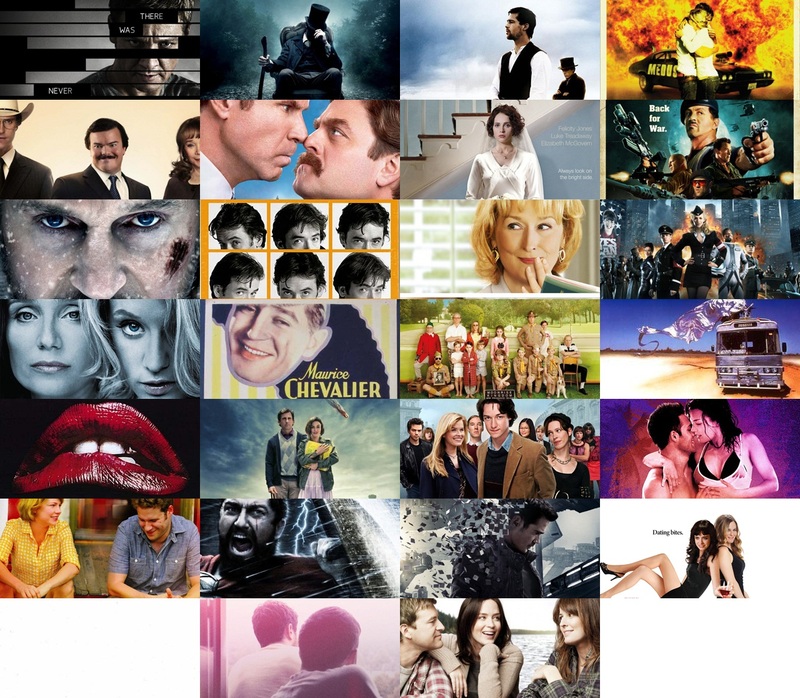 I've seen 404 movies all up (bound to go up to maybe 407 by tomorrow's end), with 361 different titles all up. I achieved my New Year's Resolution of watching 300 new-to-me movies, as I've seen 315 thus far. The first movie I saw this year was The Piano Teacher, the last will be Inception. So that's what I saw this month/year. What were some cool films you saw this month, and how many films did you see all up this year? I think Abraham Lincoln: Vampire Hunter works out because it was honest about the kind of film it was. I'm at 297 for new watches. Will reach 300. I think I'm not even close to 300 but my TV-show hours might exceed the length of 500 movies it seems. I do spend a lot of time watching series. My NY resolution will be write everything I watch down! And I mean everything! Haha, I would love to watch more TV, but I'm too busy watching movies. However, I did catch up on a fair bit of TV last year, watching Downton Abbey, New Girl, Game of Thrones and Once Upon a Time. I did that last year on my Facebook and on Letterboxd, two very handy tools! There's something about statistics that always kind of consoles me... makes me calm. Anyway, you didn't like Rocky Horror?????!!!! I know what you mean, I felt very at peace making all of these stats. I did like it, it was just very...strange. found that it is really informative. I'm going to watch out for brussels. I will be grateful if you continue this in future. Many people will be benefited from your writing. Cheers! ABRAHAM LINCOLN: VAMPIRE HUNTER works so well because it plays it straight. I think if it was silly and self-aware it wouldn't work nearly as well as it does. The audience knows how silly it is, they don't need the film winking at them the whole time about how silly it is. As someone from Texas, BERNIE is a magnificent portrayal of what Texas is like. Linklater is a native Texan himself. Ah, maybe I should give the movie another go. I *was* watching it on an extremely hot day, which would have clouded my judgement. Mind you, I still quite liked it. Ah, well Texas looks like a right interesting place! Really? We Need to Talk About Kevin three times? You really do like Ezra. I'm curious, which aspects of Moonrise Kingdom made you uneasy? Ah, well I do like Ezra, but I saw it a second time for something I was working on at school, and a third time because my friends wanted to watch it. The whole 'young love' thing made me really uneasy. IDK, it didn't really feel all that sweet. Glad you watched The Assassination of Jesse James by the Coward Robert Ford. What a gorgeous movie! And you're not alone on Hope Springs. It was one of 2012's worst for me. Great, at least I'm not the only one who despised Hope Springs! OOH YOU SAW ROCKY HORROR FOR THE FIRST TIME? I think I might have been the same age as you, my friends were horrified I hadn't seen it in high school. I thought it was weird too at first, but oh my god, I love it now! I always sing along to it, and I saw a live show in Melbourne a couple of years ago! 300 didn't work for me either - I like slo-mo, but this was too much. Guy Pearce certainly does not disappoint in Priscilla :) One of my favourite Australian films, that is! A live show of it would be awesome! Guy Pearce was awesome in Priscilla. It is now one of my favourite Aussie films, too! Impressive stats! I'd say TDKR was one of my most watched too. Need to re-watch 21 Jump Street too! 21 Jump Street is always a good watch! Wow, some pretty impressive stats. I could never keep track of all the films I saw for such a long period of time as you have. I was the opposite on The Campaign, I thought it wasn't as funny as I thought it would be. I keep track through my diary, Letterboxd and a Facebook note. It was surprisingly easy, and very helpful! I didn't have high expectations for The Campaign...it wasn't amazing, though, haha. JESSE JAMES is a shade too long? Shut your mouth! Seriously though, very interesting statistics. You had a great year in film! I must do a post like this of my own, even though it will be extremely overdue. But oh well, I'll do one in a few days anyway.